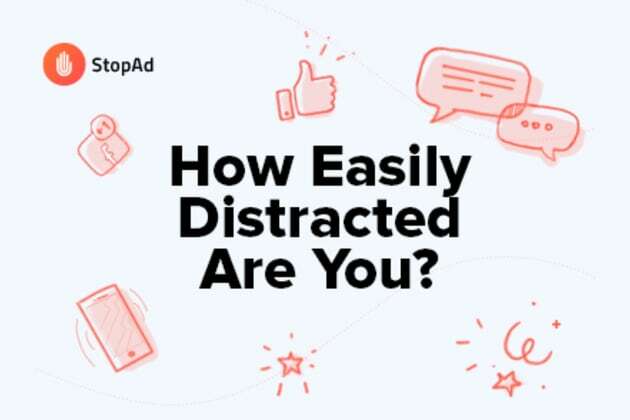 How Easily Distracted Are You? What does your working space look like? Which phone mode is your favorite? How many coffee breaks do you take daily? Two or three is usually enough. None. Coffee breaks are for slackers. Do you have an extremely chatty colleague? No, I don't. I guess I work with introverts. Omg, I'm afraid this “colleague” is me. How would you assess the noise level at your workplace? Do you keep your phone in sight while working? Of course, I receive lots of important notifications. Normally, it lies on my desk with the screen facing down. No, I usually keep it in my bag on silent. Do you have access to your social media accounts from a corporate computer? Of course not. It's against our corporate policies. Yes. I take work breaks on Facebook. No, but who cares? I use my smartphone to check news feed. Do you rely on productivity apps to stay focused while at work? No. I prefer multitasking over staying focused. I use a timer app, and it boosts my productivity. I've been thinking of trying one. How many tabs are open on your browser simultaneously? 1 to 5 is my absolute maximum. More than 5. FB, YouTube, Gmail, a few tabs with articles. I use multiple browsers to keep all websites I need open simultaneously. Have you ever found yourself watching Netflix and scrolling your Facebook feed at the same time? Why would I need FB if I'm already watching a movie? That's what I normally do. Even the best movies contain boring moments. Sometimes it happens, but I always remind myself to focus on the movie. Do you have an ad blocker? Of course I do. Online ads drive me crazy. I have a browser extension, but it doesn't block all ads. Ad blocker? What is an ad blocker? What do you think about push notifications? I have them enabled for all apps I have. That's how I never miss a thing! Push notifications are too distracting. I disabled them all. I only use them for important apps like Gmail, Facebook, and Instagram. Bad news here. It seems like distractions play an important role in your life and keep you from living life to its fullest. You need to educate yourself on the topic of distractions and limit the power distractions have over you. Start with reading our mini report on distraction. It will give you a better understanding of what it is and what you can do to fight it. Wow, what is your secret? Your level of distraction is lower than average. It looks like you are aware of your biggest sources of distraction and know how to minimize their negative effect on your life. Great job, keep this up! Much like the majority of modern people, you are easily distracted given half a chance. However, you recognize there is a problem and put efforts to limit the number of distractions in your everyday life. Not bad for a start, but there is surely a room for improvement. Distraction is the enemy of greatness; it is hardly possible to perform at your best or master a new skill when there are lots of distractions around. However, not all people are equally vulnerable to the ruining power of distraction. Some of us can easily resist it, while others fall for interruption given half a chance. Find out what kind of person you are.